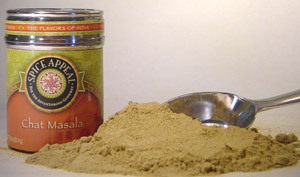 Reminiscent of the bazaars of Old Delhi, this delicious Indian spice blend is used as a condiment seasoning that is sprinkled directly on fresh fruit, steamed vegetables, and “raitas” or yogurt based salads. This masala’s wonderful blends of pomegranate seeds, green mango powder and black salt create a unique tartness that perfectly complements the sweetness of fruit. Sprinkle on papayas, mangos, avocados, and pears with a little squeeze of lemon. This tangy spice blend includes red chili, salt, cumin seeds, mango powder, cinnamon, cloves, cardamom, pomegranate seeds, and a variety of other spices.